Different types of nails and fasteners are used to assemble wood pallets and containers. Choosing appropriate fasteners is crucial to optimize pallet performance, and so is selecting the appropriate length, diameter, type and thermal treatment. In general, the nail should penetrate one third of its length into the piece to be nailed and two thirds into the other piece, with a 1 - 1/4" minimum penetration in stringers or blocks. There should not be any nail within 1/2" of the edge or extremity of any piece and nails should be spread every 2" maximum. To minimize splitting any stringer, nails should be staggered. Nail heads should be countersunk by 1/16" to 1/8", so they won't resurface during the drying process, to avoid damaging the goods. Pallets with larger extremity planks or in higher density wood will be more resistant. It is correctly assumed that abuse damages pallets, not handling. No matter how well-assembled is the pallet, it cannot withstand abusive use. Thus, to optimize pallet performance, it is essential to carefully handle them. Members of the A.M.P.C.Q. have approved that the length of the stringer should be the first dimension mentioned to designate a pallet. Therefore, a 48 x 40 pallet has 48 inch long stringers and 40 inch-wide planks. 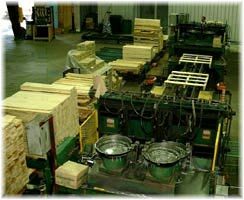 In general, wood used to manufacture pallets is divided in three categories: high density hardwood, low density hardwood and soft wood (or resinous). Components must have uniform thickness and width and 50% of components must meet or exceed dimensions targeted during the manufacturing process. Good Manufacturing Practices imply that the thickness of any plank may not vary by more than + or - 1/32". These tolerances are acceptable for general pallet manufacturing. For some pallets (such as C.P.C., CHEP, G.M.A., etc. ), tolerances may vary. We suggest you check the specifications for these pallets. sixth of the plank's width and one third of its thickness. Most pallets are assembled with steel spiral type nails. The shank may vary from 0.090" to 0.132", according to its lenght which may vary from 1-1/2" to 3". Nails may be resin-coated to increase their resistance to a vertical force or may have thermal treatment, to increase their resistance to a lateral force. The most frequently used; its very sharp end reduces to a minimum any fibre breakage when the nail is hammered in. Reduces the risk of splitting the plank, especially in hardwood. Requires great force to penetrate hardwood; this type of point practically eliminates all risks of splitting the plank. If wood pallets are adequately repaired and recycled, they can increase efficiency and contribute to reducing costs for pallet users. Repairs for premium quality multiple use pallets. Low cost solution to prolong pallet life and improve its appearance. Standard repairs for multiple use pallets. Acceptable repairs for non-returnable pallets only. For these three repair categories, nails and fasteners exceeding the surface of the pallet should be hammered in, to avoid damaging the goods placed on the pallet. Any exposed nail point will not be tolerated. Using metal plates to repair stringers is accepted, as long as stringers are not completely separated or have pieces missing. - What is the value of the merchandise to be handled ? - What is its weight ? - What is the size of the merchandise to be handled ? 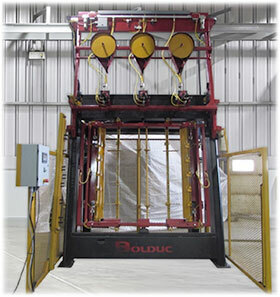 - What type of handling equipment will be used ? palletization and transportation systems ? - Can we optimize the cubic space available (interior dimensions of the transportation vehicule compared with the unit load and its weight) ? - Is it profitable to return pallets ? - Should we participate in a pallet exchange program (C.P.C. or others) ? Once you have determined pallet size, style, type and model, you must prepare specifications and precise plans which should include details like pallet dimensions and components, types of nails or fasteners to be used, and all codes and markings which will have to be affixed to each pallet. As you can see, the process to establish and estimate for a simple material handling pallet can be laborious. That is why we strongly recommend that you work with a member of the A.M.P.C.Q. (Quebec Pallet and Container Manufacturers Association). Each member has the experience and qualifications to ensure a quality product. Also, he voluntarily follows every practice revealed in this manual, because he knows that your satisfaction and his future are at stake.